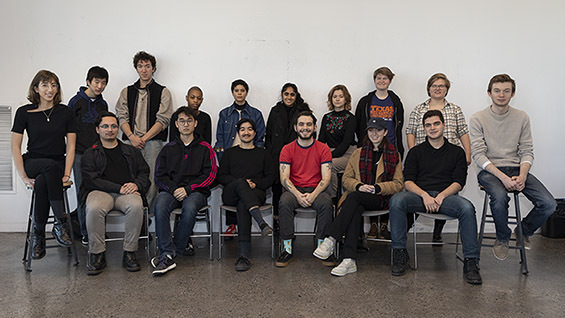 As The Cooper Union celebrates the 160th anniversary of its founding, another notable milestone has also been reached in 2019: the 110th year since the creation of the institution’s first self-organized student representative body. 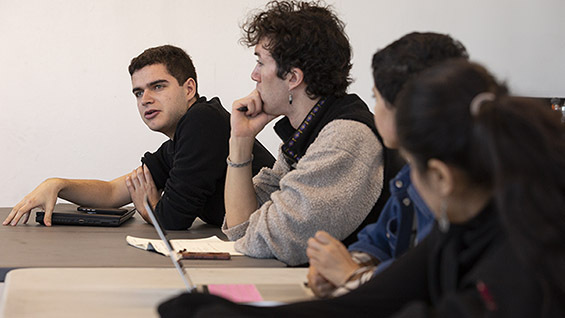 Though its role and name have evolved over time, what is now known as the Joint Student Council (JSC) continues a process rooted in the very founding of The Cooper Union. 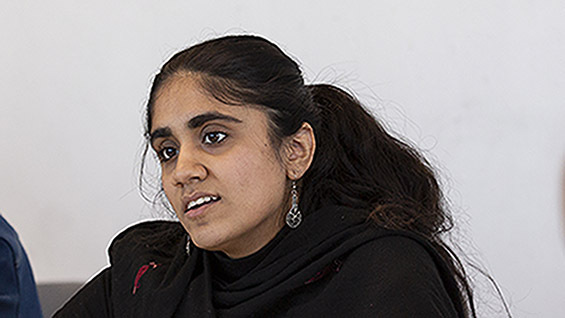 Most colleges and universities have student governments, but not many of them have become so integrated into the whole governance of the institution, from weighing in on curriculum decisions to advocating for expanded student resources, social or academic. We decided to look back at the history of student government and see how it has played a role in shaping Cooper. At its founding, Peter Cooper charged The Cooper Union’s trustees with the task of giving students the opportunity to devise “such rules and regulations as they, on mature reflection, shall believe to be necessary and proper.” His belief in civic engagement was part of a pedagogical tradition widely thought to have originated with Thomas Jefferson’s founding of the University of Virginia in 1818. Jefferson and Cooper both believed that ordinary citizens could raise themselves up to lead their communities through access to education. Civic responsibility was important to Peter Cooper, and he saw The Cooper Union as a laboratory to teach and develop enlightened, engaged citizens. Nonetheless, the student body, largely comprised of working adults who rarely had time to partake in extracurricular activities, could not initially form as cohesive a community as traditional colleges of the era. Generally, students took classes when not tending to duties at work and home, with little opportunity for socializing or advocating for changes at their school. Instead, most were working hard at becoming as self-sufficient as possible. Eventually, though, Peter Cooper’s hope for student leadership at the school became a reality when The Cooper Union Students League was formed in 1909. It was part of a wave of students organizing self-government groups during the Progressive Era, one of many consequences of widespread political reform in the face of corrupt power brokers like Boss Tweed in New York and “Hinky Dink” Kenna in Chicago. At Cooper, the league was created “as a means for instilling more school spirit in the institution…for the purpose of commemorating annually the birthday of Peter Cooper, and the founding of The Cooper Union, and of promoting sociability and good-fellowship among the students of Cooper Union.” The group produced the earliest form of The Cable—the school’s yearbook—as well as the school newspaper, The Pioneer. The league organized Cooper’s athletic programs, provided welcoming receptions for new students, and provided entertainment for the student body. 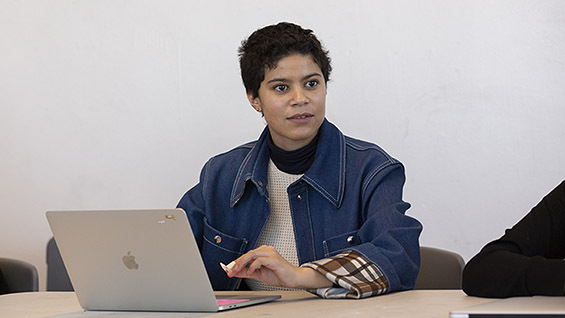 In short, it largely functioned as a social organization, evidence that The Cooper Union was increasingly developing an identity beyond a place to take free classes, but as a community for its students. Students’ heavy workload coupled with the school’s emphasis on self-reliance both help explain some of the apathy towards student governance evident in school documents over the years: at Cooper, students have long been accustomed to creating programs, events, and exhibitions driven by their own initiative, not under the auspices of any group. The Saturday Program, for instance, began not as a student government idea or administration mandate, but was formed by a group of students who took it upon themselves to teach high school students (see feature on page 8). But in 1977, student leaders again felt it was critical to form a collective, this time to address academic concerns, a Cooper-NYU library merger, and the dynamic between students and administrators. In keeping with the times, the issues of interest to the Cooper JSC during the 1970s were far more related to academic and institutional concerns than anything their predecessors tackled. Since then, the JSC has been an active participant in determining school policy on multiple fronts. The current structure of student government reflects the three divisions of the school. Each has its own student council, and each council has its own constitution, governance structure, and organizational methods devised by its elected members. Administrative chairs take on the most formal leadership roles within their council and represent each school across campus. The JSC then gathers each school’s council into an overarching body that addresses institutional issues from a student perspective. Leadership rotates among schools for each JSC meeting. Other governance structures on campus typically include representatives from the student councils, and on some committees, student council reps even have voting rights and are able to influence matters from curriculum development to the Code of Conduct. 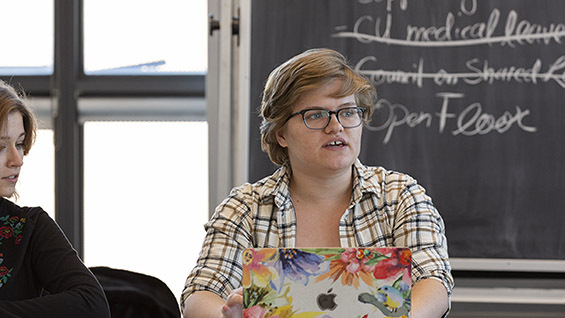 For example, in the Faculty Student Senate, council representatives work with Cooper’s professors to make recommendations on issues of academic planning and development directly to Cooper’s leadership. There are even student trustees on the school’s board who, since 2015, have had full voting rights. While any student, JSC member or not, may run for student trustee, it’s the JSC that organizes the campus-wide vote and presents the results to the board. The board then makes the final decision on whether or not to accept the suggested candidate. They recently used that information and power to voice the student perspective on several school-wide projects. Most notably, JSC members had a dialogue with Nader Tehrani, dean of The Irwin S. Chanin School of Architecture, about newly available facilities fitted with a laser-cutter, 3D printer, CNC, and rapid prototype machines. “When I started on the council we had a new dean [Nader Tehrani],” said Parker Limon AR’19, an administrative chair. “He was willing to make changes to the Paul Laux Digital Architecture Studio based on what the students wanted. We as a council were able to organize everyone’s thoughts and communicated that to the dean. That was a big one for us.” Other recent JSC accomplishments include rewriting their constitution, raising money to support survivors of Hurricane Maria, and organizing the Faculty Auction, an annual fundraiser in which students bid to go with professors to cultural events around the city.